States and cities across the country have promised retirement and health benefits to their workers but have failed to set aside money to fund the promised payments. This is a ploy used throughout government of delaying paying for entitlements. This allows politicians to to reap the rewards of granting generous pensions, while leaving it to the next schmuck to figure out how to pay for it. These promised pensions are beginning to come due. In the past five years alone we have seen cities like Detroit, San Bernardino, Stockton and Harrisburg declare bankruptcy in an effort to escape mounting debt as a result of underfunded pension plans. Much like Aladdin attempting to impress Jasmine, these cities have attempted to show their employees the world. The difference is that they lack an all-powerful genie to provide the funding. Other cities, like Chicago, New York City, Boston and Philadelphia, and states, like California, Illinois and Connecticut, are in just as bad shape. 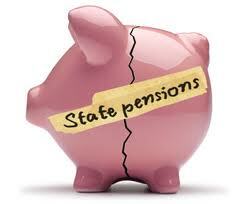 The most recent data shows that Chicago’s per capita unfunded pension liabilities stand at $18,596. Similarly, the citizens of New York City, Boston and Philadelphia face unfunded pension liabilities ranging from over $7,000 to nearly $10,000 per capita. Some of these problems are even worse at the state level. The citizens of California face total unfunded pension liabilities of over $750 billion, which averages out to nearly $20,000 per person. Illinois has only funded 22 percent of the state’s liabilities and Connecticut is only slightly better at 23 percent. Both states face unfunded liabilities of over $24,000 per capita. In 2014, states faced a total $4.7 trillion in unfunded liabilities, up from $4.1 trillion in 2013. If these unfunded liabilities were divided amongst all Americans, it would amount to $15,000 per person. We have reached this point because politicians feel that they can make promises they have no intention of keeping, just so they can keep getting re-elected. Another problem with pension funding is that localities often assume 8 percent annual growth in the fund without taking into account the risk of not reaching this growth. Enhancing this problem, many cities pay out extra money to workers and retirees when the funds exceed targeted returns, but do not put extra money in the fund when returns fall short of the targets. Promising the world to retirees does nobody any good if the government cannot deliver on its promises. A growing concern is that once enough states and localities go bankrupt, or even near bankruptcy, they will likely look to a broke federal government to be their all-powerful genie and save them from their unfunded pension liabilities. The federal government bailed out the banks and car companies so it may be difficult for them to say no to retirees that will not receive the pensions promised them by pie-in-the-sky local politicians. But it will be important that Congress say no to any unfunded pension bailout. People need to face reality and understand that unrealistic promises cannot be kept. Bailing out poorly managed local governments would only reward bad behavior and punish the local governments that actually managed to keep their books balanced. This would only exacerbate the problem and encourage bad governments to continue to act recklessly, while coaxing good governments to follow the lead of misbehaving ones. No crisis for me, sux 2 b them that have those over promised pensions. They will be just like the victims of Bernie Madoff. Their unions and the State officials over promised and I'll do nothing to help them. Good for the ones that already collected, too bad for those that didn't. They should have realized the scam and funded their own retirement free of the lying Government and Union officials but, then again, nobody has ever accused Govt employees of being that intelligent, ha ha. As I've written before, the Washington DC Metro is not my favorite form of transportation. Indeed, I dream of the day when I have a job with a driver who will daily pick me up at my apartment and deposit me at work. Often I have to take a second to collect myself outside our building to suppress the anger that wells up during the course of my ride each day. The ride for which I pay ever increasing fares in an ever more cramped car where actual air temperatures have no bearing on the use of heat or AC. Suffice it to say, we have a swell system. It seems that the quasi-constitutional TARP that has given money to institutions outside its legislative bounds, has exceeded it's Congressional authorized limit. This comes as a surprise to just about no one. This morning it was reported that Pres. Unless you want to get very, very angry. You better not pout....'cause Card Check's coming to town. The big news last night was President-Elect Obama's pick of Rep. Hilda Solis to head the Labor Department. Politico has a good write-up here. Her dyed in the wool Labor credentials and past voting history leave no doubt that she'll be behind Obama's Card Check agenda in a big way, paying off their union supporters. Rep. Since I wrote about the Metro asking for a bailout and noted that there were at least some flagging industries that still hadn't asked for a bailout, to no surprise to anyone, that has changed. Newspapers have indeed started asking for their handout because without newspapers, according to people who have never heard of the internet, citizens would have no idea what was going on. Michelle Malkin has been watching the ridiculousness unfold over on her blog. Looking for a handout? Get in line. The NY Times reports that groups looking to get in on the government bailout action now extend far beyond the much reported Big 3 automakers to include car and boat dealers.